Seven years. 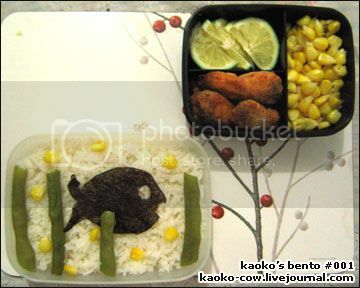 It’s been seven years since my first bento blog post. Who knew this blog would last this long? Definitely not me. My first few blog posts about food were just little entries on my personal livejournal blog. But after the first few bento posts, I knew I had something special. And I knew that I had to give it its own little spot on the web. Kitchen Cow was born. First as a livejournal blog before I eventually migrated it to its own domain. Sure, things have changed. I don’t prepare bento as much as I used to. Life changes have pushed me to other directions, but every once in a while, bento beckons me to come back. What better time than during Kitchen Cow’s anniversary, right? My first ever attempt at bento. I’d like to think I’ve gone a long way from this. So, after a long hiatus, is a panda-themed bento. 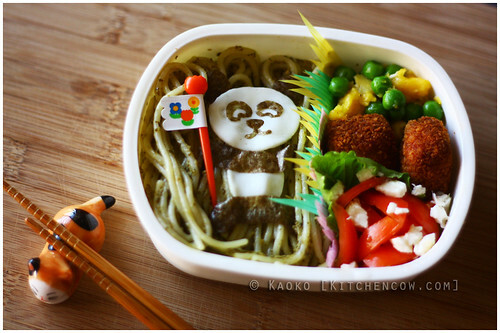 I’d like to think that the panda’s emerging from a pesto spaghetti forest. Admittedly, I was hoping to get some kangkong (swamp cabbage) to make a “bamboo” forest but we didn’t have any at the time. The panda’s made of fried egg white and nori sheets, and one the side are chicken nuggets, a pea and egg yolk scramble, and a tomato and feta salad. I’d like to say that putting it together was a cinch, but since I’m out of practice, it definitely wasn’t. Truth be told, I can’t imagine how I used to do this every single day. And before heading off to work in the mornings even. Who was that creature and where is she now? 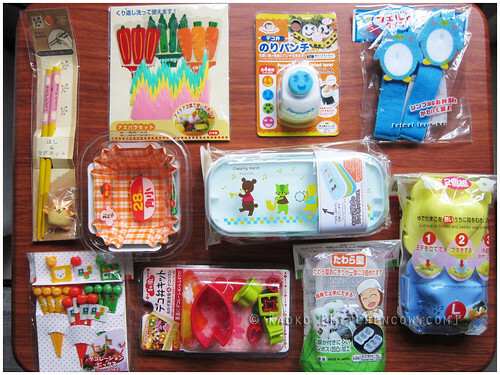 Still, it wouldn’t be quite an anniversary without a bento giveaway right? Like the giveaways I used to hold, it isn’t of much monetary value but I’d like to think of the item choices as a nicely put together set to get you started on bento. If you’re not a beginner though, I’m sure you won’t mind receiving more odds and ends to your stash. I know I was still oohing and aahing at the bento items even if I don’t use such things as much anymore. This giveaway is international. With a few exceptions though, only entries from people in countries serviced by the Philippine Post Office’s SAL and/or Surface Parcel delivery will be considered. In case of a Philippine-based winner, prize will be sent via courier of Kitchen Cow’s choice. Winner will be selected via Rafflecopter. Haven’t used Rafflecopter before? Don’t worry, it’s easy to figure out. (Entering Rafflecopter Contests Guide). You don’t need to create a Rafflecopter account. You just need to sign in with Facebook or enter your name and email address. It’s not much different from entering your name and email address in the comments section of this blog. While your names and email addresses will be collected for this giveaway, Kitchen Cow will not use these except to contact you in case you win. Nor will these names and email addresses be shared with / sold to a third party. In case the winner doesn’t respond within 1 week of the announcement email, Kitchen Cow reserves the right to draw a new winner. In case the winner’s entry is invalid for any reason, Kitchen Cow reserves the right to draw a new winner. As mentioned earlier, Kitchen Cow will be using the Philippine Post Office’s SAL / Surface Parcel to ship in case the winner is based outside the Philippines. That said, be prepared to wait for your prize. In case of an international winner, any customs taxes will be shouldered by him / her. And most importantly, winner must love food. Ready to join? Rafflecopter away! This entry was posted in bento, giveaways. Bookmark the permalink. Your blog is pretty cool & looking forward for more giveaways! Kitchen cow’s unique presentations and cool recipes! Man, if it’s about easy to understand oriental stuff, this is the place! I love your items.. so cute..
Like all your bento boxes, love the designs!! I love your avant-garde designs. wishing you more congratulations on your 7th anniversary. clap clap clap! Your blog is inspiring. I love cute stuffs and having a cute meal interest me most. I LOVE EVERYTHING ABOUT KITCHEN COW! I LEARNED ABOUT TO PREPARE THIS AND THAT. THIS BLOG IS AWESOME FOR THOSE PEOPLE WHO WANTS TO PREPARE SOMETHING BEAUTIFUL AND DELICIOUS! Nice blog. Hope to win! I love all the great Bento lunch ideas! My toddler starts a “Mother’s Day Out” program in a few weeks, and I’m excited to use all of these great ideas to make his lunches fun and healthy! Your blog is amazing & looking forward for more giveaways! It’s so adorable. So Korean! & I love it. Yay!